The fires that ravaged parts of California's iconic wine country haven't dimmed its beauty one bit, and now it's past time we all went back. You've got options, but the absolute best way to get from San Francisco to California's most fabled stretch of wine country has to be over the Golden Gate Bridge, up the 101 freeway and via the Sonoma Raceway. Do this, and within 20 minutes or so from America's most iconic span, you'll be zipping across the wide open, southernmost reaches of Sonoma County, very quickly getting into the left lane for the turn for Highway 121. This scenic—if typically quite busy—strip of winding, two-lane road is more portal than quick hop north. Lined with vineyards, offering endless views of windblown uplands, this is your transport from reality, into the very special world that is the Carneros region; it's the signal that you're almost there. Almost to Sonoma, or to Napa, if that's more your thing. Almost to your hotel, to that winery you've been dying to visit, to the restaurant you've been waiting for years to try. Just a few more minutes. What a California thing, to be in a place this beautiful, with its naked green hills, its swirling, swooping vineyards, decaying barns, humble farm stands and alluring winery tasting rooms, and not already feel as if you've arrived. Not this beautiful place—we've got to get to the other beautiful place, just beyond. For years, I have been driving through the typically cooler, greener Carneros, admiring the beauty but also finding myself looking ahead, to the next thing. Thinking ahead to the upcoming stop sign, where you make your choice to head east, through the region and into Napa, or up the valley to Sonoma's charming small towns. Will there be traffic? Will I get to where I'm going, on time? Should I have left earlier? Why are there so many people on the road? Recently invited to spend the weekend in the middle of a working vineyard in Sonoma, I jumped at the invitation—for years, I’ve experienced wine country through the lens of the region's many, quite often very expensive hotels. I have slept at the thousands-of-dollars-a-night Auberge du Soleil, checked into luxury hideouts in various canyons, I've slummed it in roadside motels. Always a visitor, never really a guest, I'd never really had the full, what's-it-like-to-actually-live-here treatment, and of course I could make it, of course I'd clear my schedule. Actually, could I come right away? I texted all the friends I could think of within driving distance, and told them to meet me there. When I found out exactly where we'd be going, my excitement ebbed, at least a touch. The house we'd be staying in was barely there, after all—in fact, it was just a few minutes north of that previously mentioned racetrack, with its busy schedule of NASCAR events. 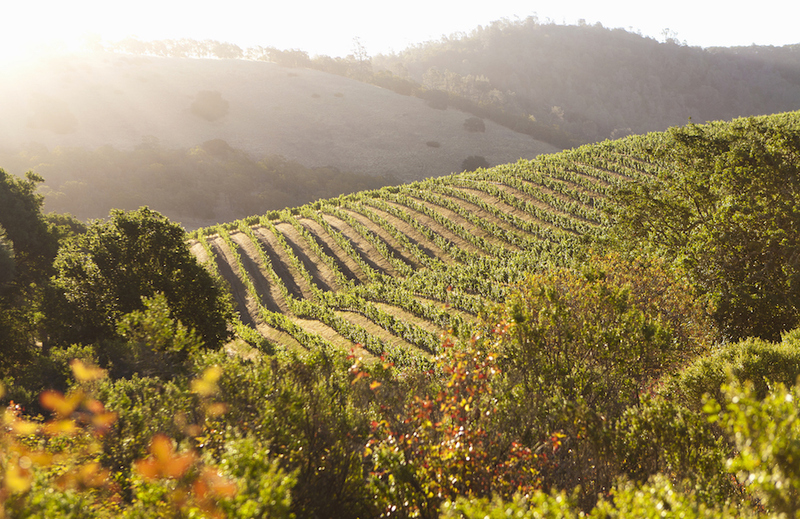 We'd be 20 minutes from Napa, nearly 15 from Sonoma's historic plaza. A reasonable drive to all, relatively close to none—isn't that so California? 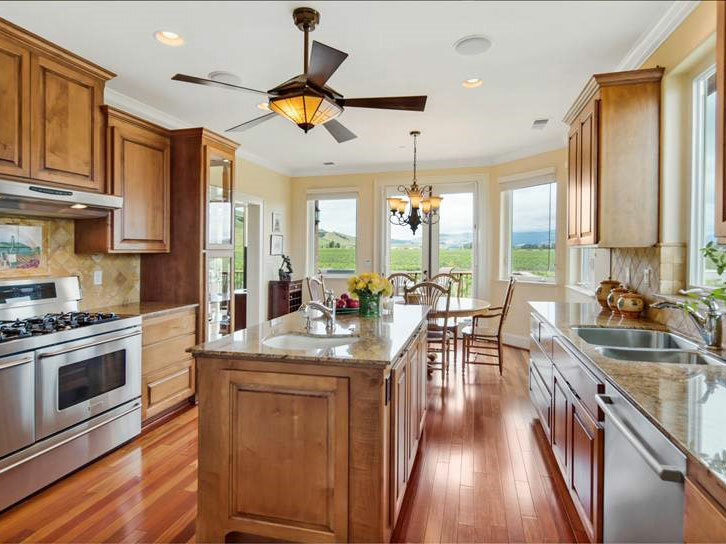 The house is available for short-term stays through vacation rental site HomeAway, which meant I had every chance to acquaint myself with the property beforehand, and it was, let's be clear, a stunner. 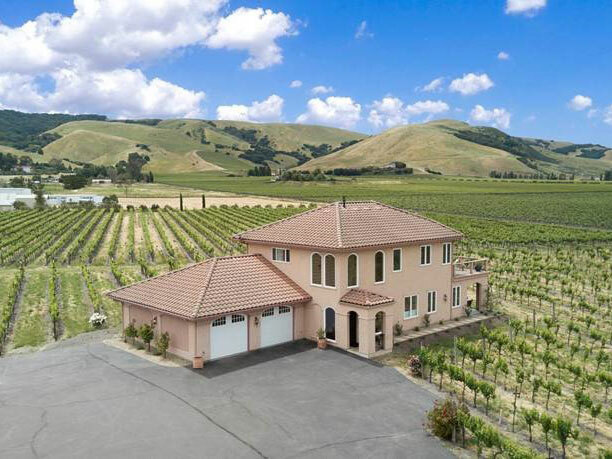 One of those Cali-Tuscan numbers, the home was built, quite literally, in the middle of a vineyard, with views directly up the Sonoma Valley—not to mention, mountains as far as the eye could see—from a wraparound upper deck. Offering 2,400 square feet of space to move around in, three bedrooms and a well-designed, light-filled kitchen opening straight to the patio, the average nightly rate of $680 (at the time of this writing) compared very favorably to the cost of a luxury hotel room in the region, but provided a completely different, fully independent experience, not to mention plenty of room to rattle round in. So what if there was a short drive to get to everything—this was a house in the middle of a vineyard, and the owners were making their own wine. Did we actually really need to go anywhere else? 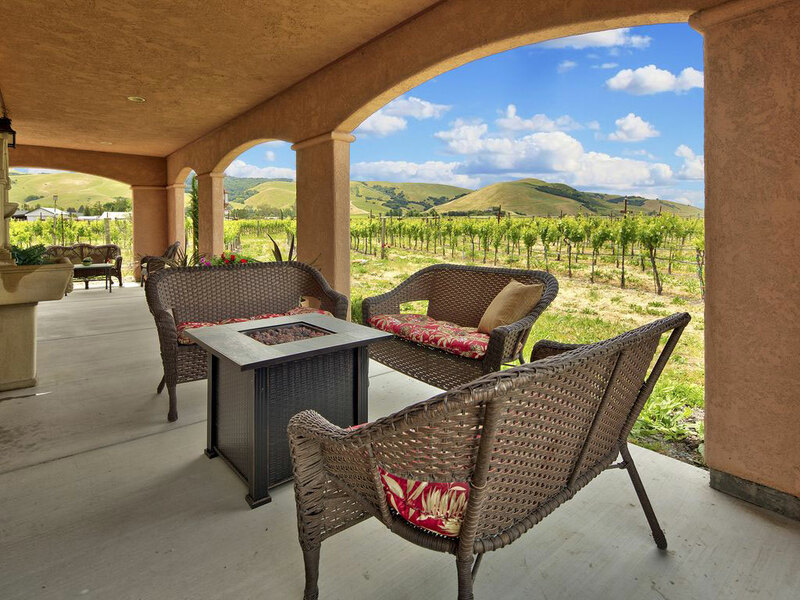 What would be so wrong about just sitting on that patio, watching the sun rise and then set again, over and over again, watching the vineyards come back to life after one of those blessedly short California winters? Skipping out of the big city early on a sunny Friday afternoon, one of those where everyone else appeared to have had the same idea, any qualms regarding the location of the house were swiftly allayed when I saw just how fast I could get here from the real world. And that's what the weekend turned into—one happy realization after another, as to just how much there was going on right here, right out the end of our narrow country lane. Olive oils at The Olive Press, part of the storied Jacuzzi Family Vineyards, were just around the corner. The vineyards at the Schug Carneros Estate proved to be a beautiful place to wander, when we felt like moving out from our own. The Sunset Magazine-branded gardens and outdoor test kitchen were practically across the road; I'd whizzed past what looked like a tourist trap for years, but the complex where they were located, known as Cornerstone Sonoma, actually proved to be a terrific stop, with a couple of interesting wine tasting opportunities, plus a local distillery, and even more, non-co-branded gardens to explore. One of Sonoma's most popular casual restaurants, The Fremont Diner, was just around the corner, it turned out, making it easy to get in ahead of the inevitable breakfast and lunch crowds, and the historic center of Sonoma town wasn't much further away, with its scores of restaurants, cafes, tasting rooms, shopping opportunities and impressive preserved architecture. A few more minutes drive meant so much more to do, and we tried to do as much of it as possible; it was well into the weekend, driving north toward Kenwood, before any damage from last year's fires presented itself, and even then, there wasn't very much to see, at all. If you are a casual visitor to the area, and you spend most of your time on the well-beaten path, you will find it hard to imagine anything bad happened at all. Mostly though, the further from that pretty little house in its pretty little vineyard we went, the more I wanted to go back. It wasn't a resort, sure, but it was better, at least to me. What could be better than having your own vineyard to stroll through, barefoot, coffee in hand, watching the morning fog give way to blue skies? How were we going to find anything better than one of those fabled California sunsets, in such a dramatic location, viewed from our private deck? We cooked simple meals, thanks to an abundance of food on hand next door in Sonoma, sipped more of that house wine, slept long and slept well, truly content in the moment. That was the real stuff, the stuff worth every penny of the ask. In the end, nobody in that house wanted to leave.